The conflict in the town of Zhanaozen (Kazakhstan) taking dozens of lives did not start a day before. Already in May 2011, oil workers were protesting in the town’s central square demanding a pay raise from the owners of a Kazakhstan-Chinese oil company. Since the capitalists declined to give in, the oilmen chose to go on strike. In return, all of them were sacked: fifteen hundred people thrown out into the streets with nothing to live on. Instead, other and more tractable people were hired, thanks to a mass unemployment in the country. For half a year, laid off workers were picketing at the central square, lighting bonfires and changing their demands to getting back their jobs, having their former employers punished and, for the sake of formality, the government resigned for not willing to partake of their destiny. Indeed, no one ever engaged into any negotiations with the protesters, no central authorities came to visit them from the country’s capital. A couple of times, the local authorities attempted to disperse the protesters, a few trade union leaders were arrested, followed by some strange murders of the protesters’ activists left uninvestigated. Some respectable political oppositionists from Almaty came down for an unsuccessful attempt to “hitch on”. Majority of protesters were the so called “oralmans” or the repatriates from the neighboring Uzbekistan, who in fact did no care much about politics. Instead, the protesters found their principal ally and an “information partner’ in the semi-marginalized and unregistered movement of “Socialist resistance’, declaring its goal as “end of capitalism via revolution”. They also found support from certain left-wing members of European parliament. Alas, a manifestation of sympathies from the West did not add any chances to win. Moreover, patriotic minded bloggers immediately dubbed the strikers “the agents of American influence”. Yesterday’s oilmen transformed into players in a game started from abroad by Ablyazov and Aliev, opponents of Nazarbaev in exile. As one local political observer claimed in his blog, the former oppositionists were associated with Boris Berezovskiy, and further, with the British and American influential circles, aiming to “re-format the borders of the former Soviet Union”. Thus, somehow, unraised wages have become a “actor in the geopolitical struggle over Eurasian destabilization”. It is still unclear what has triggered a bloody culmination of the meetings. According to official information, a meeting of protest suddenly escalated to a violent riot, subsequently severely suppressed by the police. Whereas workers claim in turn that the conflict was provoked by police ramming a vehicle into the crowd, reminding of riots in Cairo. It also reminds me of Andijan events that had happened in Uzbekistan over 6 years ago. Then, a days long meeting of protest against unjust court verdict had, within just a matter of few hours, escalated into an act of terrorism, seizure of prisons and the local municipality. In both cases, the authorities extremely benefit from acts of violence on the part of opponents. Refraining from any action, the authorities let a peaceful crowd lose control and provoke violence. After an initial attack, the authorities feel free to use any means of suppression without a limit. While the crowd throws paving stones, the police responds with firearms. Doing so results in a double or even triple impact. Firstly, the authorities have their own violence justified. Secondly, they let the crowd know they are ready to use force. If people show their discontent quietly, it can just be ignored. Once people take to active actions, they need to be “turned” into terrorists. This is the path chosen by the Kazakhstan’s government to counter actions of protests. If you can not calm the crowd down, for lack of brains or will, doesn’t matter, you have to demonize the crowd, and then start shooting. Afterwards, it would be nice to discover a bit of ammunition or leaflets by a banned Islamic party when searching activists’ homes. In era of a total Islam phobia and war on terror, such evidence could serve as a justification in front of influential partners in Europe, too. Tough but fair suppression of “terrorist oilmen” helps Nazarbaev to fulfill another important goal and put the screws on in the light of upcoming parliament election, including by means of Internet locking, and knocking down the “unsystematic” opposition. Yet, it can only work in a short term, especially in the time of Internet, no matter how hard you try to block access. In Russia today, you get news other than from TV, using new and prompt media, such as social networks and blogs. Sooner or later, we will all know the truth. Already today, news spread across Kazakhstan by word of mouth. 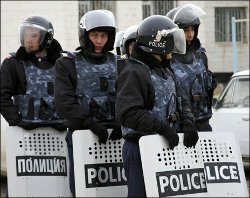 Watch out now, for the overall protest against the authorities might engage the illegal terrorist organizations, the presence of which in Kazakhstan is not even a question anymore.